A fourth suspect was arrested Tuesday in connection with the slaying of a young Navy man who was gunned down after pulling over on a Logan Heights freeway ramp to help a seemingly stranded motorist. Mexican authorities took Edson Acuna, 24, into custody south of the border on an arrest warrant charging him with murder in the death two months ago of 21-year-old Curtis Adams, according to San Diego police. His alleged role in the slaying was not immediately disclosed. Acuna was turned over to U.S. authorities at the international border and booked into San Diego Central Jail late Tuesday afternoon. He was being held without bail pending arraignment, scheduled for Wednesday. While driving through southeast San Diego shortly before 2:30 a.m. Oct. 27, the victim and his girlfriend came upon a parked car on the connector ramp between southbound state Route 15 and northbound Interstate 5 and decided to stop and offer assistance, homicide Lt. Anthony Dupree said. Moments after Adams stepped out of his vehicle, someone inside the other car opened fire, killing him, Dupree said. The assailant then drove off. A short time later, California Highway Patrol officers came upon a car matching the description of the killer’s vehicle stopped on northbound Interstate 5, near 32nd Street, and saw a man walking away from it. 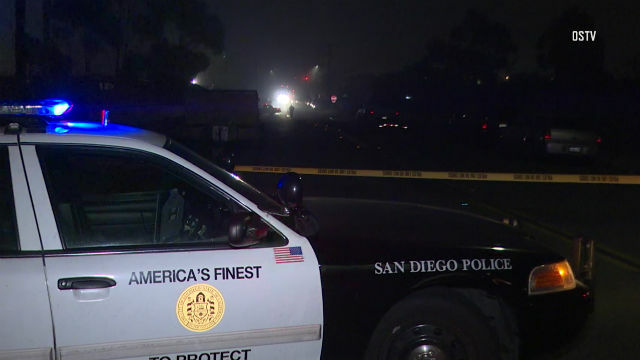 The state personnel notified San Diego police, and officers went to that location and detained the suspect, later identified as 21-year old Brandon Javier Acuna. Brandon Acuna, the younger brother of Edson Acuna, was arrested on suspicion of gunning down the good Samaritan serviceman. He was booked into county jail on charges of murder, robbery, burglary and firing a gun into an occupied vehicle. Investigators believe Brandon Acuna had been involved in a separate shooting about 10 minutes before Adams was killed, Dupree said. The victim of that crime came under fire — but was not struck — upon encountering several people trying to break into his vehicle on Boundary Street in the Mount Hope area, according to police. Detectives arrested a second suspect on Oct. 31, 38-year-old Susana Galvan, on suspicion of being a criminal accessory in the case, according to prosecutors and jail records. Another alleged participant in the deadly crimes, 24-year-old Harvey Elias Liberato, was taken into custody on Oct. 29. He booked on suspicion of the same slate of charges, including first-degree murder, as those facing Brandon and Edson Acuna. Authorities have not released details on Galvan’s and Liberato’s alleged involvement in the case. Adams, a Brooklyn native, enlisted in the Navy in 2016. At the time of his death, he was a steelworker with Amphibious Construction Battalion 1 at Naval Amphibious Base Coronado. Brandon Acuna, who made an appearance in the case Tuesday afternoon, is scheduled to be back in court Jan. 8 for a status conference and Feb. 5 for a preliminary hearing.